On May 9, 2017, avelumab received a second accelerated approval from the FDA, for the treatment of patients with locally advanced or metastatic urothelial carcinoma that progressed during or after platinum-containing chemotherapy or within 12 months of neoadjuvant or adjuvant platinum-containing chemotherapy.10,11 Both approvals will require additional evidence to complete the FDA review. Among the 242 patients with advanced urothelial carcinoma, the most common (≥20%) adverse reactions with avelumab were fatigue, infusion-related reaction, musculoskeletal pain, nausea, decreased appetite, and urinary tract infection. Fourteen (6%) patients who received avelumab died secondary to events that included respiratory failure, sepsis, cerebrovascular accident, and gastrointestinal events. 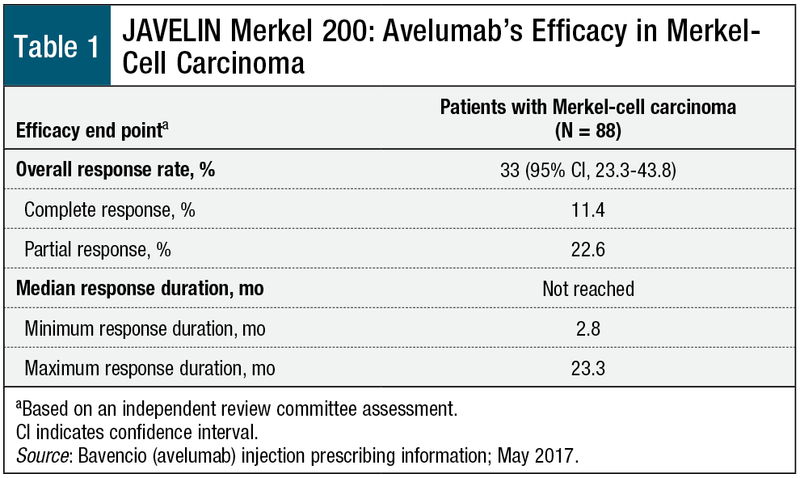 Avelumab, a PD-L1 inhibitor, is the first drug approved in the United States for patients with metastatic Merkel-cell carcinoma, a rare and aggressive skin cancer. This approval provides the first treatment option available for patients with this rare but aggressive disease. 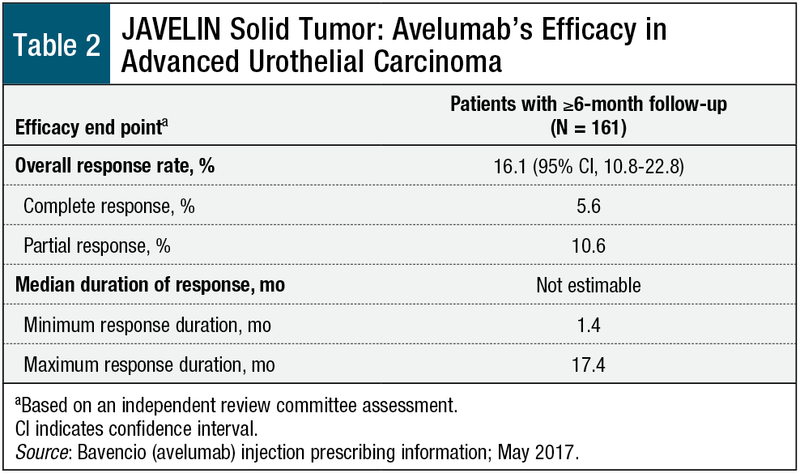 The efficacy and safety of avelumab were established in a phase 2 clinical trial for metastatic Merkel-cell carcinoma and in a phase 1 clinical trial for advanced urothelial carcinoma. Both approvals were done under the FDA’s accelerated review process. Final approval of both indications is contingent on confirmatory evidence from clinical trials. 1. merkelcell.org. What is a Merkel cell? Merkel cells are found in the skin, where they function mainly as touch receptors. http://merkelcell.org/about-mcc/what-is-a-merkel-cell/. Accessed June 11, 2017. 2. merkelcell.org. What is Merkel cell carcinoma? Merkel cell carcinoma (MCC) is a rare, aggressive skin cancer with roughly 2,000 new cases per year in the United States. https://merkelcell.org/about-mcc/what-is-merkel-cell-carcinoma/. Accessed June 11, 2017. 3. merkelcell.org. Causes of Merkel cell carcinoma: learn more about who is at elevated risk for developing Merkel cell carcinoma and what we know about the causes of this cancer. https://merkelcell.org/about-mcc/causes-of-merkel-cell­carcinoma/. Accessed June 11, 2017. 4. Grabowski J, Saltzstein SL, Sadler GR, et al. A comparison of Merkel cell carcinoma and melanoma: results from the California Cancer Registry. Clin Med Oncol. 2008;2:327-333. 5. Feng H, Shuda M, Chang Y, Moore PS. Clonal integration of a polyomavirus in human Merkel cell carcinoma. Science. 2008;319:1096-1100. 6. Miller NJ, Bhatia S, Parvathaneni U, et al. Emerging and mechanism-based therapies for recurrent or metastatic Merkel cell carcinoma. Curr Treat Options Oncol. 2013;14:249-263. 7. National Cancer Institute. Bladder cancer treatment (PDQ)–health professional version. Updated June 5, 2017. www.cancer.gov/types/bladder/hp/bladder-treatment-pdq. Accessed June 11, 2017. 8. National Cancer Institute. SEER cancer stat facts: bladder cancer. http://seer.cancer.gov/statfacts/html/urinb.html. Accessed June 11, 2017. 9. US Food and Drug Administration. FDA approves first treatment for rare form of skin cancer. March 23, 2017. www.fda.gov/newsevents/newsroom/pressannouncements/ucm548278.htm. Accessed June 11, 2017. 10. Bavencio (avelumab) injection [prescribing information]. Rockland, MA: EMD Serono; May 2017. 11. US Food and Drug Administration. FDA grants accelerated approval to avelumab for urothelial carcinoma. May 9, 2017. www.fda.gov/drugs/informationondrugs/approveddrugs/ucm557162.htm. Accessed June 11, 2017. 12. Kaufman HL, Russell J, Hamid O, et al. Avelumab in patients with chemotherapy-refractory metastatic Merkel cell carcinoma. Lancet Oncol. 2016;17:1374-1385.